150 years ago today, Confederates soldiers burned the city of Chambersburg, Pennsylvania. Although this event was not the first time Confederates started a fire near the city, this event proved to be the most destructive. Other detainees had told McCausland that bank funds had already been removed and sent north for safekeeping. 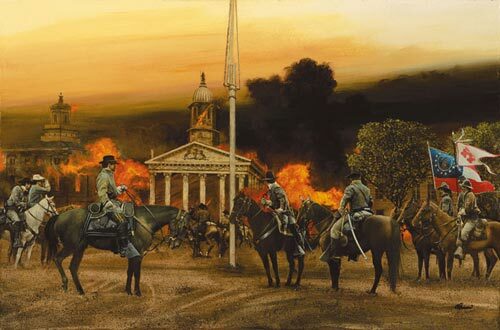 When Douglas informed McCausland that he could find no money, the general had the courthouse bell rung to call citizens to the square, and then ordered his troops to burn Chambersburg. Rampaging through the town, Confederate soldiers broke into houses and evicted residents, smashed furniture, heaped the pieces into piles, and then set them on fire. By eight a. m. the city was in flames. As the city burned, renegade soldiers robbed citizens, looted stores, and drank whatever liquor they could find. Some demanded ransom money to spare a home, then torched it anyway after the ransom was paid. Not all Confederates participated in the sacking of Chambersburg. The Masonic Temple was spared when an officer who was also a Mason posted guards to prevent its burning. When the colonel of the 21st Virginia Cavalry refused to obey the burning order, he was arrested and his entire unit sent out of town. Other Confederates tried to help frantic citizens retrieve household goods before their homes were burned. In the end, perhaps 550 buildings went up in flames. In spite of the widespread arson and looting, the Rebels killed only one civilian, an elderly African American. Angry citizens killed at least five Confederates by the time the raiders had withdrawn.